Sterling advanced to the state finals for the first time by defeating Morton 25-12, 25-7 Friday. STERLING – Josi Borum waited for four years for this moment. It didn’t disappoint the Sterling senior. 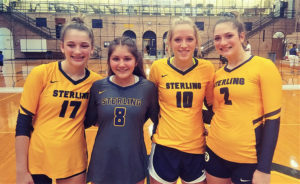 Josi Borum teamed with her sophomore twin sisters Bree and Brooklyn Borum for 31 kills as the host Golden Warriors dominated in all areas in a 25-12, 25-7 victory over Morton before a packed house on Friday to capture the Sterling Class 3A Supersectional. 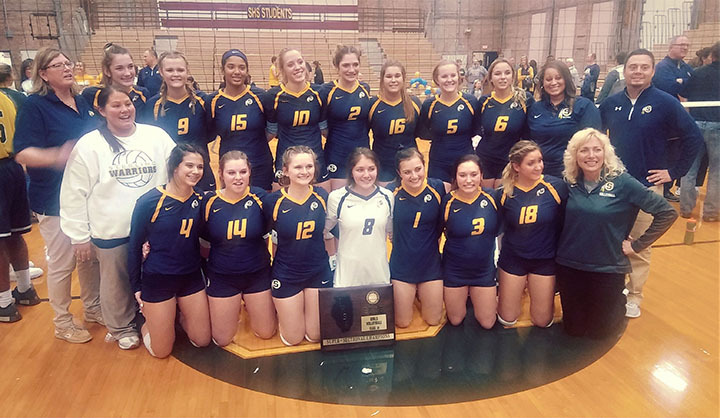 The Golden Warriors (39-1) advance to the state finals and will face Joliet Catholic, a 25-11, 25-7 winner over St. Laurence at the Rich East Supersectional, in the first semifinal at 4:00 p.m. on Friday, November 9 at Redbird Arena on the campus of Illinois State University in Normal. The two teams met on August 25 in the semifinals of the Metea Valley Tournament. The Golden Warriors won 25-19, 19-25, 25-19 and went onto win the tournament. It’s the first-ever trip to the state finals for Sterling, which had lost in its previous four supersectional appearances (1980, 1981, 2014, 2016). Morton (31-9) fell short in its bid to advance to the state finals for the first time since losing in the Class AA quarterfinals in 2006. “We knew what we wanted to do,” Josi Borum said. “I wasn’t nervous at all. I was excited to play in this gym one last time. It was a perfect night with our home crowd and home support. They sure did. Josi had 10 kills, 13 assists and 2 blocks. Also playing at rightside hitter and setter, Bree banged 8 kills, dished out 15 assists and added a block. Her twin, Brooklyn, blasted a match-high 13 kills and added 7 digs at the outside hitter position. “Ever since the postseason started, Josie has stepped up and been a great leader,” said Sterling coach Dale Dykeman. “Not only on the court, but she’s displayed the intangibles and been a big leader off the court, too. She’s a big reason why we are going to state. Josi Borum and fellow co-captain, senior middle hitter Gretchen Gould, were both on the team two years ago that lost 25-22, 25-12 to Bloomington Central Catholic at the Mendota supersectional. There was no repeat of that this time. Everything was working for the Golden Warriors in the match as they never trailed. There was a trio of first-set ties, at 1-1, 3-3 and 7-7. The final tie was forged when Morton had its best spurt of the match in a 4-0 run. Junior rightside hitter Lindsey Dullard had a block and an ace to start the spurt and freshman outside hitter Katie Krupa (3 kills) clubbed a kill before a miss-hit tied it at 7-7. But Bree and Brooklyn boomed two kills apiece as Sterling answered with a 5-0 run and led the rest of the match. Ahead 16-10, the Golden Warriors closed the opener on a 9-2 burst. Josie jolted 3 kills to start it off and senior defensive specialist Jaylynn Razo ripped an ace on set-point. Sterling scored the first 2 points of the second set and raced out to leads of 4-1 and 8-2. Ahead 9-4, the Golden Warriors went on an 11-0 outburst. Sophomore libero Lexi Rodriguez (12 digs, 11 service points, 3 aces) served the final 10 points, which included a pair of aces. Bree brought a lot of the offense in the burst with 3 kills and a block. Morton sophomore middle blocker Sedona McCarthy finally ended the streak by putting down a block. After an exchange of points, she put down another nice one. But the highlights for the Potters, who received 6 assists from junior setter Amanda Lichtenstein and 6 digs from sophomore defensive specialist Emme Patton, were few and far between. Razo (8 service points, 3 aces) capped a 3-0 spurt and ended the match 36 minutes after it started with back-to-back aces. After the handshakes, the fans ran on the floor and celebrated with the Golden Warriors. “Yes, they’re the best team we’ve faced,” said Morton coach Kristen Spangler, who only has one senior, middle hitter Brianna Tanner, on her roster. “They have excellent pin hitters and great ball placement. In his seventh season, Dykeman is taking his first team to the state finals. “It does feel good, but it’s not only for these girls,” he said. “It’s for girls like Kaylee Martin, who’s now a sophomore at Illinois State. She was there (in a supersectional) twice and couldn’t get through.